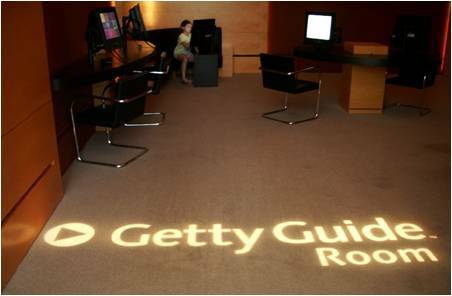 When the Getty Center opened in 1997, it featured a dedicated room to provide digital access to the collection. Along with other museums, there was a perceived need to provide comprehensive access to the collection via a touchscreen kiosk, which it did in this room and in other locations around the galleries. At the time it was something that folks couldn’t do at home, now they can. Ergo, the Getty Guide Room is no more. So the question became, what to do with the room? The most popular visitor request we get at our institution is about our founder, Mr. G, so the plan was to create a permanent exhibition about him. The museum field does not have a good track record of listening to what its visitors want. Let me rephrase that. The museum field has a great track record of listening to what its visitors want, but cherry-picks the information according to what it was already going to do. So now the former Getty Guide Room, is a lucrative children’s store. In the mid 2000’s the Getty launched a handheld device that connected to this kiosk system, it was a system that was way ahead of its time. Before coming to the museum, a visitor could go online and build a tour of works of art they wanted to see, arrive at the museum, pick up a handheld, sign in, and the device would take them on the tour they created. In the galleries, they could add works to their tour and then dock the handheld with a kiosk, upload the augmented tour, and send it to themselves to review after their visit. But wait, there’s more. The entire museum was enveloped in a wireless bubble and all content was streamed to the handheld, there was a location-sensing system in place that knew where you were. When you entered a gallery, the handheld would download the works of art in that gallery, in a clockwise sequence. It was an awesome system. When it worked. If I tell you that this system was one of the presentations at the 2012 Museums and the Web Plenary session titled Epic Fail, you’ll understand how things went. But there was an upside. We were able to use the devices for various exhibition apps and under the strategy of “content outlives devices”, a good job had been done with organising the data, which was reused and can be seen roaming free on our website and iPods Touch Tours today. At some point the devices were sold to staff for $5 a pop. Notice how thin the straps are now – a good thing. 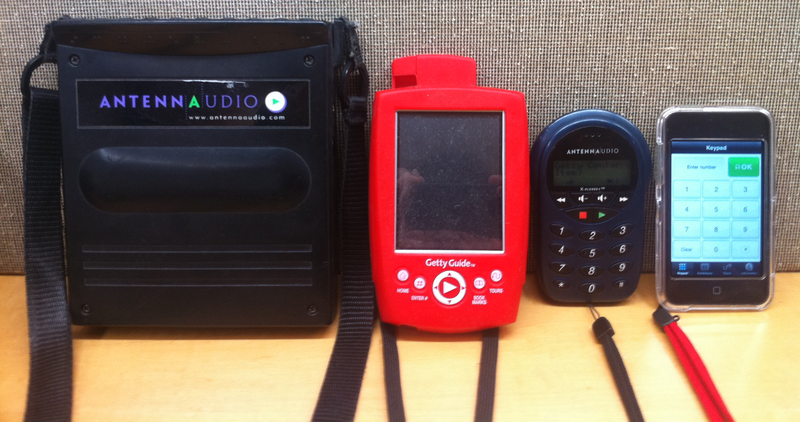 We used to charge for these devices, even the current iPod Touches that we now provide. Then for one exhibition we made them free, as you might expect we saw a dramatic increase in uptake. During this time, we surveyed visitors asking what they would pay for the devices, most visitors said it was worth $5. So after the exhibition we set the price at $5. Rentals tanked, indicating a significant difference between “worth” and “pay for”. Clearly visitors lied, justification in itself not to listen to them from now on, so we made them free again. Uptake soared once again. Bring Your Own Device (BYOD) seems to be here, at least its on the 0-1 year horizon for the 2013 Horizon Report, so that’s now. But I’m not sure I know exactly what that looks like. I’m a fan though, anything that gets us out of the hardware support business for our devices is very attractive. Clearly visitors have been BYOD’ing for years, so as an institution, when can you legitimately claim that you are a BYOD-designated museum? Recent threads on the MCN listserv would indicate there is a growing movement to either install or improve wifi in museums, so if you provide free wifi, are you BYOD-designated? If you’ve created a freely-available mobile app guide to your institution on iOS and Android, are you BYOD-designated? If your Visitor Services and Security staff are trained to troubleshoot network access problems or download issues, are you BYOD-designated? I think the defining BYOD designation is about sore-arse prevention. Anyone who has sat crossed-legged on an airport walkway floor, will know what I’m talking about. Why are the only remaining power outlets the ones farthest from any form of seating? Are they specifically situated there so that you are required to sit in full view of the traveling public? What is the police call sign for electrical-theft-in-progress? Battery life is a challenge for mobile devices particularly in a high-demand, museum guide situation – or is that an oxymoron? One of the benefits of contracting with a handheld guide provider is that they’ll swap out the batteries when they fail. In fact, their batteries are often much better than those in your iPod, and swapping a battery in an Apple device is rarely an option, you need a new one. How many of us bought 500 AppleCare protection plans? So, to be fully BYOD-designated I think you have to have all the above and provide comfortable charging stations. An espresso bar would be good too. And maybe one of those massage chairs.